Listen up ladies, you don't need to forgo comfort to wear great shoes, not when you shop at Naturalizer. Having been in the business for more than 85 years, Naturalizer offers seriously comfortable yet stylish shoes for women to go about their day to day. Comfortable shoes, you might think, are somewhat boring and reserved for your senior years, but that is far from the case with Naturalizer's current range. The Delaine for example, offers a distinct retro style in a heel, but are ridiculously soft and a pleasure to wear. Otherwise, the on-trend Pola design, which look fabulous worn with jeans or dressed-up with a frock. With summer just around the corner, Naturalizer's range of sandals come in styles to match any modern outfit. 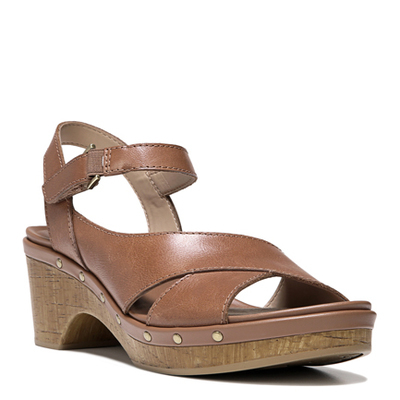 Take the Juniper shoes for example, in tan leather and a slight wedge heel with ankle strap. Alternatively, take a step back to the 70s with the Geneva heeled sandals from Naturalize, a hit with any vintage fashionista. Let's not forget Naturalizer shoes aren't all about looking good, if anything, style is second to comfort. Naturalizer shoes provide balance with every step. Shoes come with extra cushioning, breathable linings, flexible soles and lightweight material.